Here’s a recipe for an easy Smoked Salmon Cream Cheese Dip that only takes minutes to prepare and is sure to impress your guests. 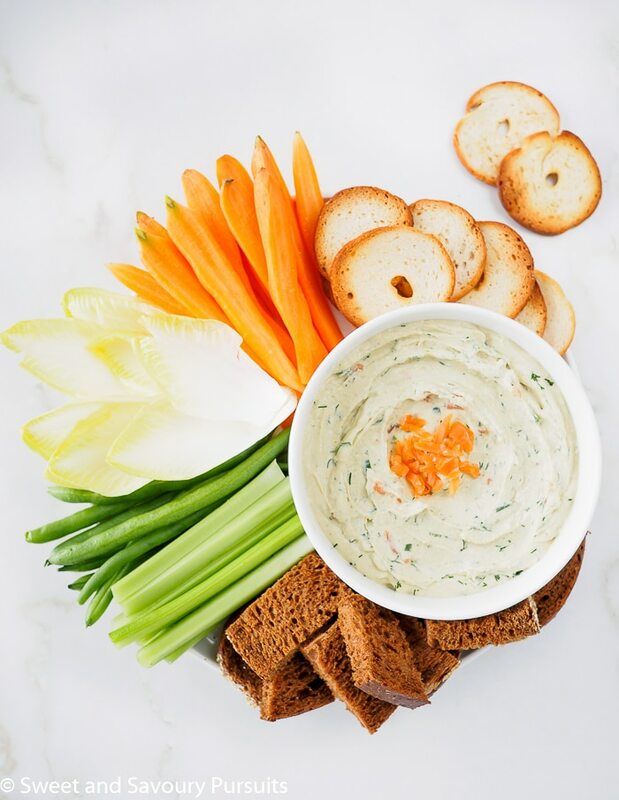 The combination of smoked salmon, cream cheese, fresh dill and green onions gives this Smoked Salmon Cream Cheese Dip so much flavour and makes this dip so delicious. 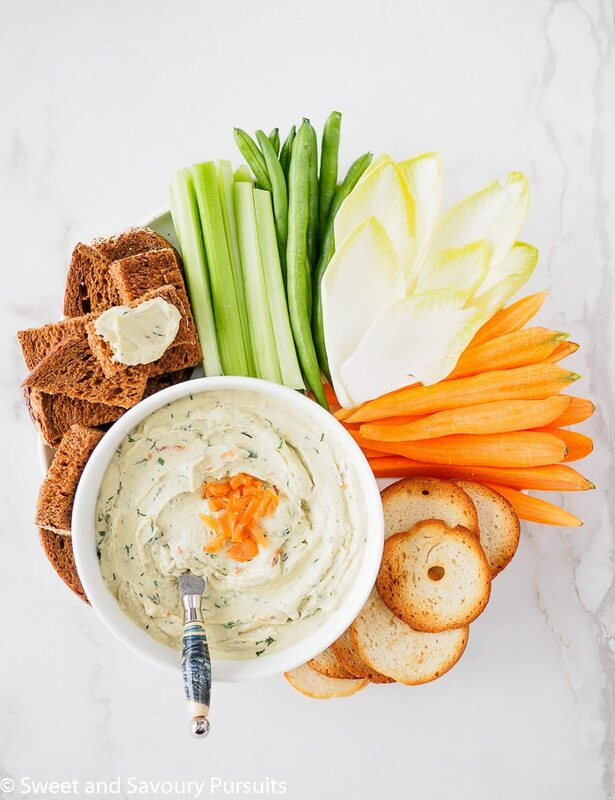 This creamy appetizer is a real crowd-pleaser and so delicious that your guests will happily nibble away on this dip all evening long. This easy recipe makes two cups of dip so this is a great appetizer for parties and entertaining larger groups. And since it can be prepared ahead of time, it’s a great recipe for taking to pot luck gatherings. 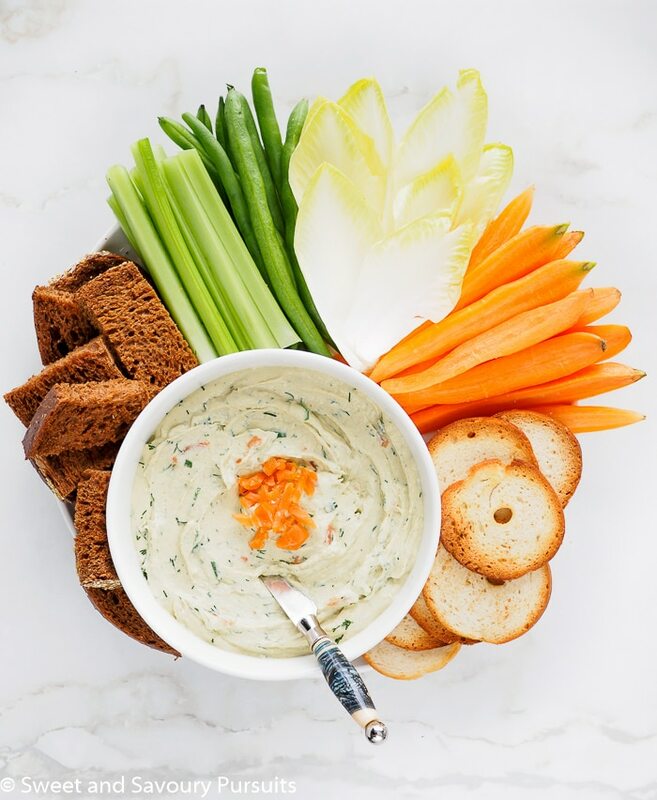 Because we lead such busy lives it’s tempting to purchase pre-made dips to make things easier on us, but taking the time to make this smoked salmon cream cheese dip at home will assure you a much fresher and better tasting dip than store-bought. It only takes a few minutes to make and it can be made it in your blender or food processor. I recommend you make this dip the day before you plan on serving it as it taste even better the next day. 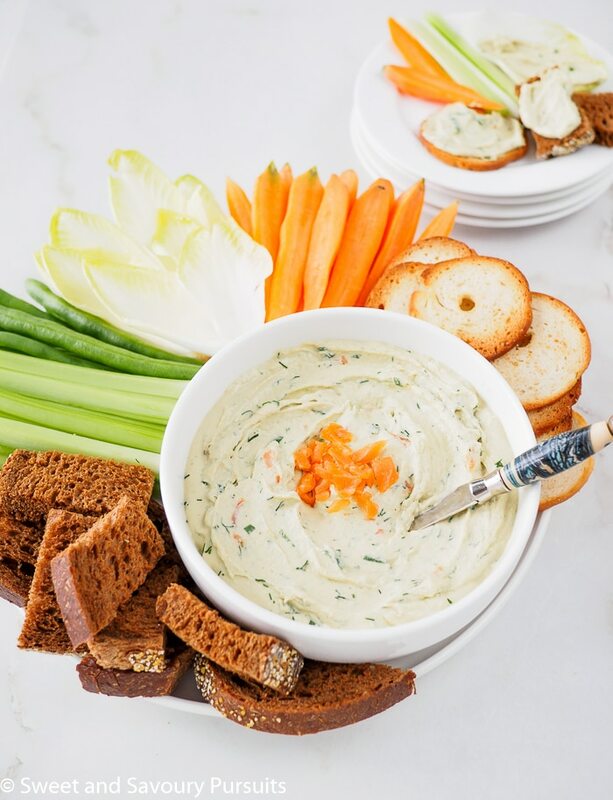 You can serve this dip with a variety of crudités, breads and crackers. I found Belgian endive, pumpernickel bread and bagel chips especially delicious with this dip. A recipe for a dip that only takes minutes to prepare. The combination of smoked salmon, cream cheese, fresh dill and green onions gives this Smoked Salmon Cream Cheese Dip amazing flavour. Before processing ingredients, reserve 2 tablespoons of finely chopped smoked salmon, 1 teaspoon. of fresh dill and 1 teaspoon finely chopped green onions. In the jar of your Vitamix or other blender or food processor, add the cream cheese, smoked salmon, sour cream or mayonnaise, green onions, dill, lemon juice and cayenne pepper. Process your ingredients until the consistency is smooth. Pour dip into a bowl and add the reserved smoked salmon, green onions and dill. Stir well, adjust seasoning if needed. Chill for a couple of hours and up to 2 days. Serve with crudités and pumpernickel bread, crostini, bagel chips or crackers. Can be made up to 2 days ahead of serving. Nutrition information is only for the dip. Mmm…. I could eat smoked salmon all day long! And I love how quick and easy this dip is to make! Not only is this great to serve to guests during the holidays, but this is fantastic to nibble on all throughout the year! That’s one thing I love about smoked salmon, it’s good anytime of the year! What a great appetizer for the holidays. Will be giving this a try for sure. Thank you Myrna, I’m sure you’ll love it! This dip looks great and you have it so nicely arranged with those veggies and breads! Thanks so much Nancy, I was concerned about arranging the platter nicely, but it was easy with all the colours, shapes and textures of the different veggies and breads! This dip looks so delicious, I love smoked salmon appetizers. Thanks, I’m sure you would love this one as well!